We recently installed two suites of EMMAs (a Belly System, two D90 Stand Systems, and Rail-Mounted Systems) at Naval Air Stations Meridian, MS and Kingsville, TX. 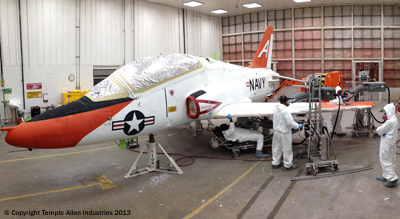 The EMMAs have been integrated into the de-paint process for the Navy’s fleet of T-45 Goshawk trainer jets. TAI is expanding its work in the European Union. While most of TAI's customers have been in the United States, the EU presents an exciting opportunity to further introduce EMMA into the global Aerospace market. Many of the aerospace surface preparation applications in the EU are similar to those in the US. However, with the stricter Health and Safety Standards in the EU governing vibration and ergonomics there is a greater demand for an alternative to the current manual sanding process. This year, TAI will be attending the Paris Air Show! We will have a section in the Maryland Small Businesses Booth, and are excited to meet with international contacts to discuss new applications and our latest technology. The Maryland booth will be in Hall 3, Stand C20. Feel free to drop by if you are attending the show. TAI continues work with Boeing and EMMAs are currently being used in the surface preparation of composite OML surfaces in the production of the newest generation commercial airliners. In parallel with TAI's expansion within the EU, TAI has recently begun the CE certification process. CE-marked EMMAs are currently available for all applications. Chris Chiang, Business Development Lead, presented at the AeroDef Conference in Long Beach, CA on March 20th, 2013. His presentation explored the challenges associated with surface preparation in the aerospace industry and how they are addressed with EMMA. We now have three new EMMA demo systems with the latest generation EMMA technology. They are now available for on and off-site demos. If you are interested in a demonstration at your own facility or in our Rockville headquarters, please feel free to contact us at info@templeallen.com. TAI has revamped our EMMA Operator’s Manual and EMMA Inspection & Repair Manual. The operator manual offers in-depth instructions on EMMA usage, training, and advanced operator skills. Our Inspection and Repair Manual contains everything one needs to maintain EMMA, including troubleshooting, repair procedures, and complete IPBs. Current clients may contact us at info@templeallen.com or 301.541.3662 to receive complimentary copies of the updated manuals.